"In our business, the women we empower are playing an increasing role to lead their communities out of poverty, something that would never have happened if we ignored the value of diversity to bring lasting change to the world’s poorest communities." 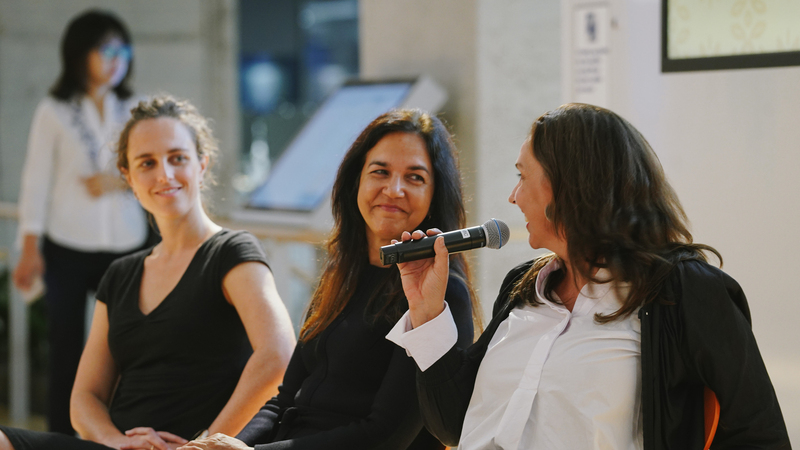 The Hon Lisa Singh, Senator for Tasmania, Alexie Seller, CEO Pollinate Group and Eleanor Loudon, CEO Engineers Without Borders Australia joined Arup in a panel discussion on whether diversity – in all its forms – could create greater social and environmental impact in development contexts. The panel was united in its view that diversity – of voices and perspectives, whether through gender, cultural background, language, age and level (or not) of seniority – is imperative to creating the right outcomes. Indeed, without it, how do we know that the bridges, water or energy solutions that we devise, as engineers, policy makers or social enterprise, are truly the right fit? All speakers acknowledged that even with the best intentions for community involvement on-the-ground, often it can be the loudest voice that is heard, or only a portion of the community that has the time to take part. For Alexie Seller, CEO Pollinate Group, it was important to be ‘intentional’ with efforts to ensure full diversity. “Every representative needs to be at the table and only through an understanding of each other’s role, can teams create impact at scale,” highlighted Alexie, drawing on her experience of bringing life-changing products, such as solar lights, water filters and clean cooking facilities, to people living in poverty across India and Nepal. Senator Singh reflected on the Australian Parliament and the need for not only more gender diversity, but greater cultural and language diversity to address biases. “You cannot ignore the power of diversity when you seek to address the world’s biggest challenges,” she said. Eleanor Loudon highlighted the new Engineers Without Borders’ report ‘Engineering Redefined,’ which focuses on the need for gender diversity in humanitarian engineering. Having set the context for the discussion, moderator Kirsten McDonald, Associate Principal with Arup International Development, highlighted the common theme of the session, that promoting prosperity for all while protecting the planet – the objective of the United Nations’ Sustainable Development Goals (UN SGDs) – will require fundamental change if we, as a global community, are to address the complex problems of social exclusion and climate change. Peter Bailey, Arup’s Global Director of Sustainable Development stated his belief in the UN SDGs as a useful framework by which we can act more responsibly. “They call for partnership and the expertise of many players – social enterprises, non-governmental organisations and the public and private sector. We must intentionally target diversity at all levels and listen to diverse voices if we are to develop meaningful solutions to the UN SDGs,” he said. Arup is proud to work closely with both Pollinate Group and Engineers Without Borders as part of its Community Engagement Programme in Australasia, with shared commitments to deepen social and environmental impact.